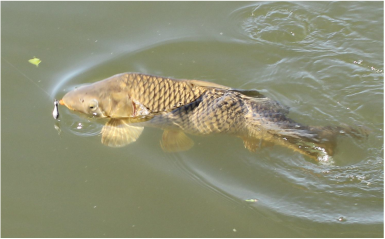 Click here to see instructions on how to rig up to catch those mighty carp. This recipe is very simple, place bird seed into a container and cover with water. After a few days the odor of fermentation will be noticed. Upon close inspection you will see bubbles coming to the surface (do not drink the byproduct as the flavor is slightly off). It is at this time to get it out of the garage or your partner will accuse you of keeping a dead skunk hidden in the garage. Warning DO NOT PUT YOUR BARE HANDS INTO THE FERMENTED BIRD SEED USE ONLY RUBBER GLOVES. Failure to do so will result in your hands smelling similar to a skunk for weeks. I hope Angelina's likes this aromatic chum. To chum the water use a large large kitchen spoon and sling it into the water. Best practice is to then throw out the spoon when you are done, you would not want to use it at the dinner table. There are many different ways to prepare the Angelina Fish for the dinner table. Don't be afraid it's Um Um Good! Check out the links below.